Recipe by Ozlem Ennor. Photography & styling by Tanya Zouev. What a magical thing it is to form friendships with people from different countries. In the time I’ve known my Turkish friend Ozlem, I have learned more about her countries’ cuisine than I’ve ever been able to by visiting Turkish restaurants or reading cookbooks on the subject. For someone such as myself who adores Ottoman food, this a real honour. 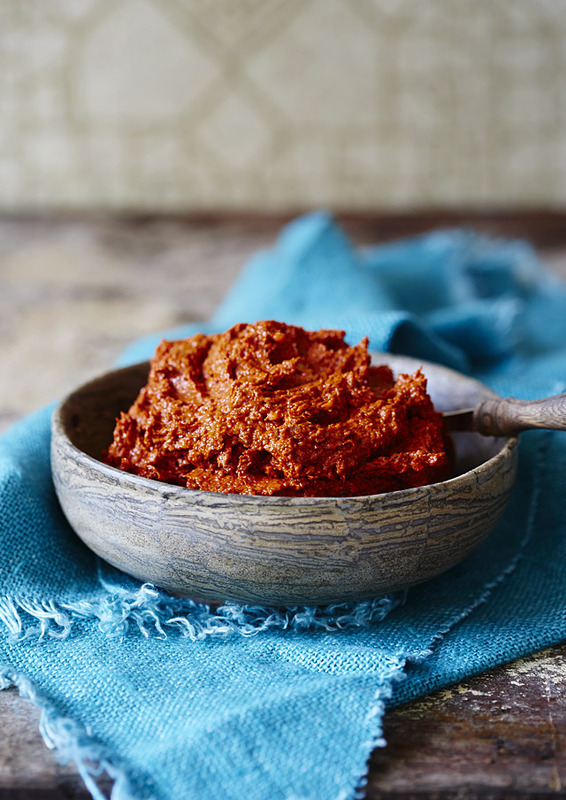 One of the many wonderful dishes she has taught me to make is acuka (pronounced ah-djoo-kah), the red pepper and walnut based sauce which is traditionally used as a spread on bread. I call this pesto-like spread “magic sauce” because it makes so many things taste amazing. I’ve eaten it slathered on meat and fish, dipped bread and crackers into it, stirred it through scrambled eggs, dropped it into soup and even eaten it by the spoonful. The original version of acuka is said to be from Syria and there are also variations such as muhummara in the Middle-East and adjik or adjika in Georgia and Russia. Some versions are spicy, some versions are not, some contain tomato as a main ingredients, others have a focus more the red pepper ingredient. Acuka has become a staple in our kitchen and I make it often these days. Trust me on this, once you hunt down the paprika paste you’ll be buying jars by the boxful and making this sauce as regularly as I do. And whilst you’re at it send a little thank you to Ozlem, I certainly do each time I make her magic sauce. Makes around 1 cup. Prep time 10 mins, cooking time 5 mins. Place all ingredients into the bowl of a small food processor and blend until almost smooth, you want the spread to retain some texture as in the above photograph. I am preferring a less-is-more approach to my food styling and photography these days, shunning over-propping and fussy images. The pesto here is so vibrant that all it needed was a beautiful bowl and a simple cloth to set it off. The bowl would you believe isn’t wooden but some kind of stone and I bought it and the fabric at a local op-shop. Both the distressed wooden surface and the background (which is a piece of old lino flooring) were picked up in local council hard rubbish collections. The only light used in this image is window light. I think the photo looks wonderful! Perfect styling for such a vibrant ingredient. I want to give this a go. It sounds so easy and tasty ! And you have set the food so beautifully. I like the textures and how the red contrast with the blue. I had this at Balkanika in NYC. It’s delish! Wonderful to come across an Australian food blogger on the foodgawker site. This looks and sounds very delicious, can’t wait to try it. Thank you. I sure it tastes very good! I used to live in Istanbul, and loved this meze!!! The locals there made with with fewer ingredients; tomato & pepper paste, onion, walnuts, olive oil and parsley. No spices, not even salt. The prepared it in a frying pan: first sauteeing the pastes in A LOT of olive oil, mixing well. Then adding the finely chopped onion and sauteeing over low heat for 15 minutes, stirring occasionally. Lastly taking the pan off heat, adding chopped walnuts and parsley. This was super delicious and I highly recommend 🙂 I love your version too, and I absolutely love your photos! Thanks for the recipe. Will try this out.